This is my last “New Artist’s Spotlight”; I don’t get to carry the title of GMA “New Artist of the Year” anymore. Now I get to pass on the title to my boys in Tenth Avenue North (2009 GMA “New Artist of the Year”). Stay tuned for their upcoming interviews! 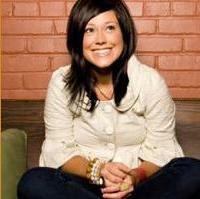 As a parting gift, I put in a special interview request for Kari Jobe to get to know her better. I first heard about Kari from my old friend Ed Cash, her producer on her debut record. It’s great to see new talent in the worship realm—especially from such a godly woman. Brandon Heath: Hey Kari, Brandon Heath here. Excited to talk to you! Brandon: Well, where are you today, Kari? Kari: I’m at home in Dallas. I was actually born in Waco, but three weeks after I was born, my parents moved back to Dallas. Brandon: So you were in residence for three weeks in Waco. That doesn’t really count. Brandon: Did you know that I lived in Texas for a couple years? I lived in Houston. So I have much admiration for you as a Texan. What was it like growing up there? What were you into growing up? Kari: My family was in ministry, so I grew up at church, falling asleep on the pews because we were there ’til the break of dawn. And by the time I settled down in my teenage years, I started leading worship at my church. I’ve always been into music and loved it. I also loved people and ministry. Growing up in that environment, you either love it or hate it—I loved it. I played volleyball in high school as well. Brandon: Did you wear the kneepads and elbow pads? I’ve seen girls play volleyball, and it’s pretty intense. What was your signature move? Kari: I was more on the back row. I was the defensive specialist, because I’m short and could get real low and get the ball back in the air. Brandon: Who were your first musical influences? Kari: I listened to a lot of Michelle and Barry Patterson. They were local artists in Dallas—very cool people. And then of course, Darlene Zschech. When I was about 13, “Shout to the Lord” was a big deal; and when I was little, 10 or so, I listened to Dennis Jernigan. Brandon: Dennis Jernigan … I need to check him out. What’s his style—acoustic? Kari: He played the piano. He did a lot of prophetic worship, singing over people, which is interesting because I love that kind of worship now. I love to write stuff that will minister over people. Brandon: Do you feel that you’ve been given that [prophetic] gift and sensitivity? Kari: I do, especially over the last couple months. My pastor prophesied over me before my CD release. He just said, “I feel like the Lord is saying the time is now, and He’s opening your voice, your mouth, to share what He wants you to share.” And I’ll be in the middle of leading worship and feel like the Lord is giving me wisdom that the congregation needs to hear. I’ll share it, and people will start weeping. It’s just been really cool to watch [the results of] being sensitive to His voice in the middle of worship. Brandon: I guess that with prophecy comes authority, because you have the responsibility to share it. And it also comes with discernment. When is the right time [to share]? You can’t just blurt out everything—there’s timing—and [it depends on] a trust that you have to earn with people. Kari: It helps me being a worship pastor at my church, Gateway, and not having just the title—because God’s not about titles—but more of a mantle of leadership and getting to go out and minister in other churches. [Because people know] I’m a worship pastor, I have a trust that I have been put [in that position] by my pastor. I love that people trust me in that way. Brandon: Being at Gateway, you certainly have that mantle. And now your mantle and platform have gotten much bigger. Talk about that. Who did you sign with? Kari: Integrity. I’m with Gateway as well, which is my church’s label. It’s really cool for me being a worship leader more than just an artist. In the last year, it’s gotten a bit crazy, really exciting. God is opening doors, and I am just buckling my seatbelt for the journey ahead. People are responding in a way that I wasn’t expecting—hoping for, but not expecting. [I wasn’t sure] if they would see it as, “Oh, this is pretty music,” or if they would respond with, “I’m using it to minister to my family,” or “My mom’s in the hospital, and we have been able to pray in the hospital.” We’re getting some pretty cool stories that it’s being used for ministry. And I love that. Brandon: When I first heard about you, Kari, it was through my friend Ed Cash. I asked him what he was excited about working on, and he said, “I’m working with this girl Kari Jobe.” I happened to meet you the next week. What was it like working with Ed? Kari: Amazing. I call him Pastor Cash. He’s such a pastor. He has such a heart for you as a person. You are making music, but he’s like, “What is God calling you to? How did you get here?” He’s just awesome. It was a phenomenal experience. I couldn’t have asked for a better producer. I didn’t really know what I needed my CD to sound like, but I knew what was in my heart and was able to say to him, “I want to do worship, and I want to connect with people.” I tried to explain what I was hearing in my mind, and he took it and ran with it and was able to totally interpret what I was trying to say. He’s an amazing artist himself. Brandon: There are so many new artists coming out who are encouraging to me. It seems like the scope of our industry is changing. God never rests and never stops calling people to do His work. Who are some people that you are excited about in Christian music these days? Kari: As a girl, I’m real emotional. I love music that moves me. I love Brooke Fraser. I can’t even explain it. I’m loving Worth Dying For. They’re newer; Integrity is releasing some of their stuff. I got to meet them this year. They love to call themselves not a band but a movement, and they want to start a movement with teenagers. I love what they’re about. They’re out of California, and they are [a group] to be watching out for, with phenomenal songwriting abilities and amazing vocals. Brandon: I’m with you on the girl front. As far as Brooke Fraser goes, so many of us in Nashville love her songwriting. Her voice is amazing and so fresh. It’s encouraging to me to see so many female vocalists like you and Francesca [Battistelli] coming on the scene and making an impact. … It’s encouraging to see new people and new faces helping us advance to new audiences. Kari, when you write, how much do you think of the non-believer? I was leading worship the other night, and the presence of the Lord was there so strongly; it was one of the strongest [times] I have ever felt it. And I was truly standing on the stage saying, “Lord, I don’t know where You want me to go.” I started sharing what I thought He wanted me to share from Psalm 118, about how the Lord draws us out of deep waters and will bring us to a place where He can minister to us and give us the strength to overcome. And I felt like people were coming to the front, to the altar, just one by one, and feeling a connection with what I was saying. I could see it in their faces that they were coming forward because they wanted this God. It was amazing. It turned me upside down. I had never felt the Lord’s presence so strongly. Brandon: It was something you’ll never forget. Kari: Never. It made me want to be more on point with unbelievers while leading. Brandon: I would say never underestimate how God will use you or your audience. Sometimes I think I just need to cater to who they are. And that’s not true. As long as we are faithful to who God has called us to be, He does the work. He will astound us with who He brings to Himself. It’s not like we accomplished anything; we’ve just been a part. I admit I forget that sometimes. I’m glad you reminded me that God can use us to draw people to Himself. Kari, before we go, I’d love to talk about your first single, “I’m Singing.” Tell us about that and your record. Kari: I wrote that [song] with Ed Cash and Chris Tomlin. Ed had the chorus already, and so the three of us got together and finished the song. And the more I get to lead it in the congregational setting, I watch people connect with it in a way that’s like, “Yeah, that is God! You are the only One. You are the only man who took the nails.” Just watching people get a revelation of who God is has been pretty fun. Radio is picking it up, and honestly, I never saw that coming. Being a worship leader, I had no idea that God would open doors with radio, and that’s been cool to watch. God has gone above and beyond. Brandon: It takes a long time to break into radio. So it’s either got to be a great song or a miracle! I bought “I’m Singing” on iTunes. Your record is also doing great; it’s been in the Top 10 on iTunes. You should be proud of your first effort. You are doing a great job. Well, Kari, it’s been great talking to you. I’m so proud of you, and I know that so many of us are pulling for you. Way to go! And I hope I get to see you again soon. Thanks! To listen to Brandon’s full interview with Kari, click here. For more info on Kari, visit karijobe.com. Brandon Heath is the Gospel Music Association’s new “Male Vocalist of the Year.” His monthly “New Artist Spotlight” on CCMmagazine.com introduces fans to new artists currently hitting the scene. Brandon’s new single is called “Wait and See,” the follow-up to his smash No. 1 hit “Give Me Your Eyes” from his sophomore release, What If We (Reunion), which recently won Brandon multiple Dove Awards including “Song of the Year.” For more info, log on to brandonheath.net.